The homes in our area run the gamut of age and style, from classic colonials to newly built tract houses. When homeowners remodel a home to suit their tastes or meet their family’s busy lifestyle, it may also mean completely updating the style of a tired-looking or “plain vanilla” home. Maybe you’ve toyed with the idea of trying some mid-century modern touches. If this appeals to you, but you don’t want to go all-out “Mad Men” style, we can offer some suggestions to give your home a taste of sophisticated retro with a careful choice of sleek elements. The “modern” home of a half century ago often featured a picture window or large wall of glass that let light stream in but also let heat leak out. 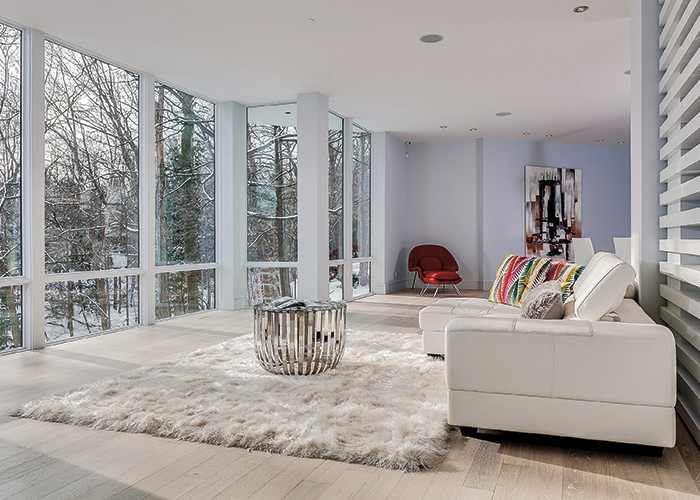 Today, you can have elegant floor-to-ceiling windows that are so energy efficient you can fill your home with light and save money on your heating and cooling. An updated version of the sliding glass patio door of the 50s and 60s is the glass wall that can withstand the harshest weather but folds away to completely open to your deck or patio for dramatic entertaining on a warm summer day. Using colors and patterns from the past can take your home design as far back as you want to go! Retro style often features bright colors like electric lime, turquoise, orange and red. But you can achieve the mid-century look using black and white, or even warm earth tones, with some bright accents. Just be sure your design plan includes sleek lines and glossy finishes. If your style preference is eclectic, but you want to add just a splash of mid-century modern, may we suggest tile in a pattern that is a blast from the past. 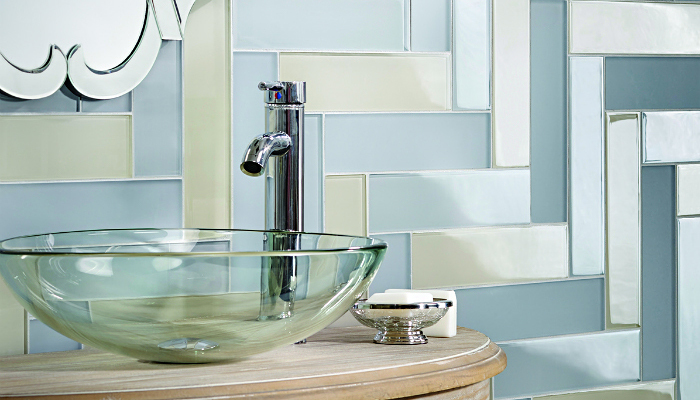 Geometric patterns in the bath or a glass mosaic backsplash in the kitchen look fresh and fun. The best thing about the 21st century versions of these products is that they’re made with the latest in lower maintenance finishes and often use reclaimed and recycled materials. One of the easiest ways to add a fresh mid-century modern look is with light fixtures. Globe pendants and spiky starburst chandeliers instantly set the tone for the room. Believe it or not, wood paneling is making a comeback! If you’re intrigued, but not ready for the dark basement rec room vibe, how about one wall of wood mosaic panels, carefully crafted of reclaimed weathered teak that evoke a Tiki Bar instead? Now that sounds like fun! We’re certainly not here to recommend going with the “I Love Lucy” era look of pink and black bathrooms or laminate kitchen counters! But mid-century modern is more than just a funky look. It can also showcase the clean, sophisticated level of simplicity that looks 21st Century fresh. We’re always ready to design an exciting new look for your home, no matter what your style preference. Let’s talk! Photos courtesy Pella Windows & Doors, Lunada Bay Tile, and National Kitchen and Bath Association KBIS 2018.